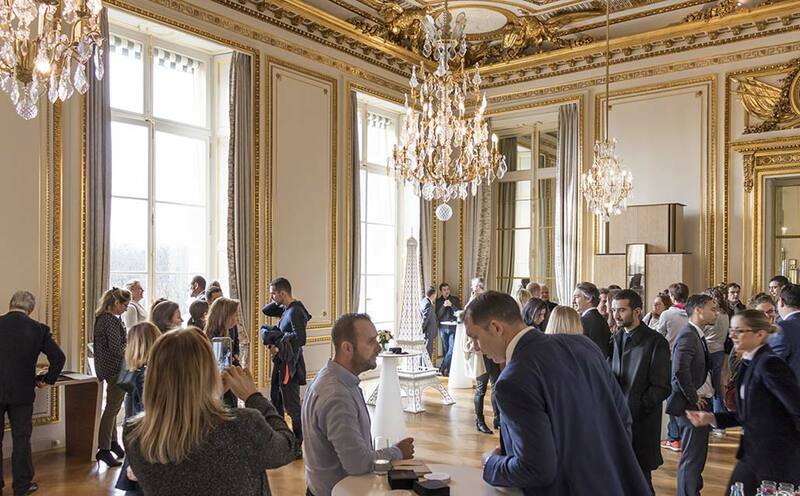 On Friday the 24th, PORCELANOSA Group presented K-LIFE at the majestic Hotel de Crillón, located in one of the most emblematic points in Paris, Place de la Concorde. With the best views of Paris, the new KRION product, K-LIFE, was presented, explaining the new properties of the material: air purification, elimination of chemical products, improved antibacterial properties, and easy cleaning. The event was attended by 350 professionals, who through sight, smell and sound (the event being accompanied by a live violin and harp, enlivening the presentation) discovered this revolutionary advance in the world of solid surface. Attendees were also offered an aperitif, presented alongside a 2,65 metre tall Eiffel Tower created with K-LIFE.